Back in high school, I had a dream in becoming a magazine journalist. You see I have been a big fan of magazines since good ol’ BOBO days. As I grew up, Kawanku, Gadis, (even Hai) were my good friends. It’s only normal when I had this aspiration to become a magazine journalist. Then dreams changed, priorities changed. I no longer want to become one. But obviously, my love for writing hasn’t faded and I still wish that my name will be printed on a magazine someday, somehow. 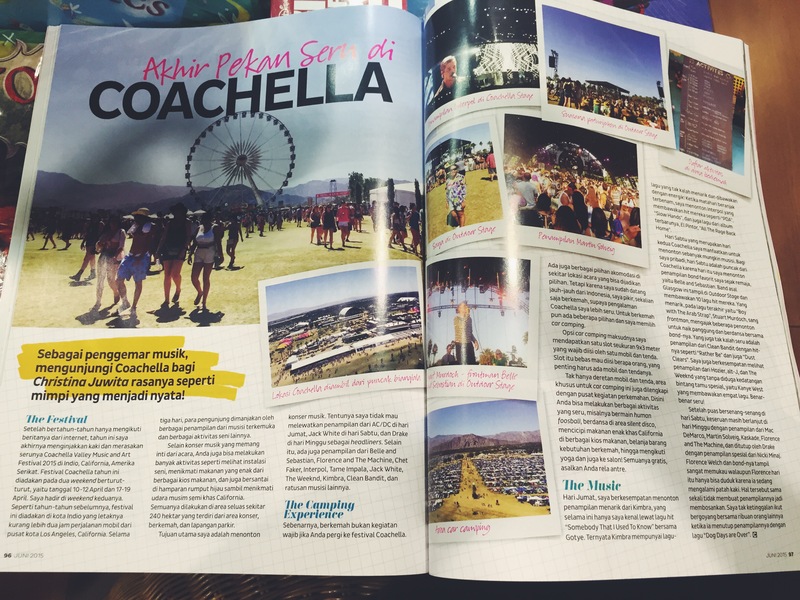 Months ago before I went to the US I suddenly had the idea to approach some magazines and offer to write about Coachella, but I did not know how. I asked my friend C – who work in a publishing group, she told me how and I finally had a deal with CLEO Indonesia magazine. Yayyy! Long story short, the trip happened, Coachella happened, and just yesterday – almost a month after I came back from the US… their June edition was out! Let me tell you how I felt when opening the page and saw my name written there. My brother was there with me – we were in a bookstore. I felt sooooooo excited and happy!!! Like I-CANT-BELIEVE-THIS-IS-HAPPENING happy! My brother was excited for me too! We hugged each other and almost jumped around in that bookstore hahahaha (lucky the magazine section was rather empty :p). Nice job Christa 😄 ! Congrats Christa. You make me not losing hope. Yes we must not lose hope Ryan. Thanks ya! Iniii kereeennn bangettttt!!!! Keren bangettt! Congratulations, Mbak! Seeing your name printed in a magazine is definitely a big thing! Keren banget! Bukti ya ini, apa pun yang niatnya dipupuk terus dan disertai usaha pasti berbuah manis :)). good job christa 🙂 wishing you all the best for the next name printed (yours of course) in more magazines. who knows that journalist will be your side job. break a leg dear. Makasih Noni.. Congrats juga untuk bukumu, mau beliii hehe di gramedia ada kan pastinya? So am I 😀 selamat ya chris..
ehhh Cleo ya. tadi sekilas kirain Gadis.. Tapi tetep, congrats!